I had a lot of fun getting ready for Sewing Summit, and sewing up some fun samples to show the things that can be done with foundation paper piecing and string piecing. 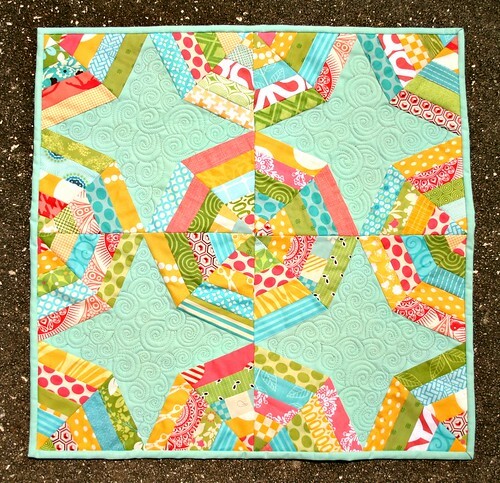 String piecing is one of the most laid-back ways to foundation paper piece a block and it can be so fun to pull a bunch of random strings together and find that they work together beautifully. String piecing can be so much fun! When I'm piecing, I always hang on to my strings and try to put them to use in string projects. It's like a fun challenge, to try to use up my strings. At the moment, they're awfully overflowing, even with these string projects that I've made for Sewing Summit. 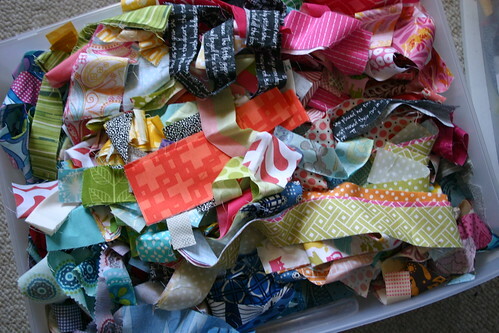 The first sample I started on began as a stack of string blocks, in shades of coral, lime, and teal. I didn't really have a plan in mind, until I decided that I wanted to make a string-pieced zig-zag quilt, so I added some Kona Coal to the string blocks and went to town. I love how this quilt turned out! I love the ways the colors pop off the coal background and the gorgeous 40wt Aurifil variegated gray thread I used for FMQ'ing. Next, I worked on a spiderweb mini, using some fun Quilter's Linen in Buttercup, and various green, gray and navy blue strings. I love making spiderwebs, and this one was especially fun because I really love this color combo. Spiderwebs can be a really fun way to put a twist on string piecing.